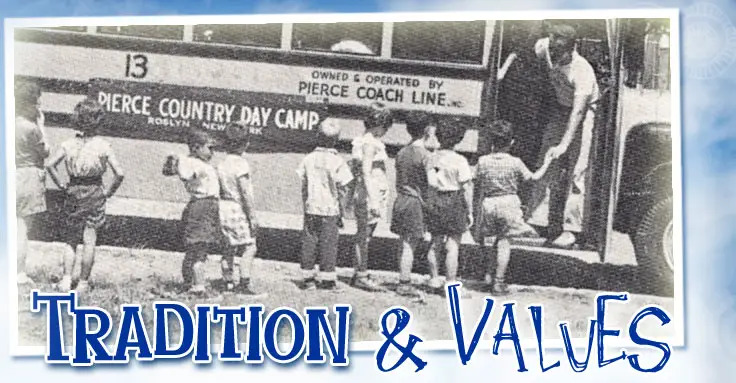 Pierce was the first, and remains the very best summer day camp in the nation! We established a national model followed by camps across America. And today, Pierce remains the nationally recognized industry leader continually raising the bar for what day camp can be! Our relentless pursuit of excellence means that Pierce campers enjoy the premier summer day camp experience available. It has been this way at Pierce for over a century, and we will keep it that way for generations to come. When Forrester “Pop” Pierce was a twenty-five-year-old Physical Education teacher and coach he envisioned a unique summer program for children. It would be a safe place to broaden horizons and boost self- esteem; an extraordinary environment where children could romp, play, sing, dance, swim, dive, laugh and most importantly be kids. This setting would promote freedom, self-expression, and positive physical and social development. It would be a true haven for children where there was something for everyone and success for all! That place is Pierce Country Day Camp! Over 100 years later much has changed, but the early values of Pop Pierce remain resolute and unyielding. Here at Pierce, we honor the legacy of Pop Pierce each day. Through our traditions and values we help campers learn and grow, all while having the most FUN imaginable! Pierce promotes mutual respect, sportsmanship and team building. As children take safe risks, foster friendships and explore new adventures, they strengthen their character. These gains endure beyond the summer and well into their future lives.